As is Boiling Point follow-up White Gold. Oh my. 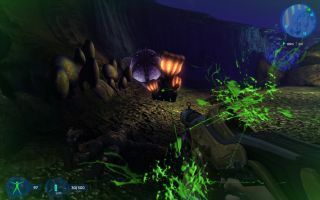 You know, I'd forgotten about Boiling Point, the Ukrainian-made, hugely ambitious FPS-RPG that was mainly notable for how hilariously buggy it was. The bugs made the game what it was, for good and bad, and so I was curiously relieved back in the day to see that its twin follow-ups, Precursors and White Gold, would launch with their fare share of technical mistakes. The problem with legendarily bad games, however, is that you really want to play them, and both Boiling Point successor White Gold, and its science fiction cousin Precursors, have been annoyingly difficult to get hold of over the years. I remember them being on Gamersgate, but only in certain regions; anyway it's all moot now, as both Precursors and White Gold have cropped up on Steam. The former features "very different planets to walk around absolutely free", "partly organic weapons with ammunition that must be bred", "controllable spaceships, robots and other vehicles," "interaction with hundreds of NPCs of different Alien races", and other bullet points. PC Gamer gave it 47% back in 2011. The intriguingly punctualised Xenus 2. White gold, meanwhile, is Far Cry 3 before Far Cry 3 was a thing; it's also a bit like S.T.A.L.K.E.R. ; and there's a smattering of Just Cause in there too. It's an open world Caribbean shooty first-person RPG. PC Gamer gave it 59% back in 2011. If you don't want to shell out £11 a piece for either game, no one will blame you, but I think it's worth keeping an eye on gaming streams over the next few days/weeks—if they're as buggy as they were previously, both games should provide plenty of entertainment value.